If I’ve learned anything about inanimate objects from cartoons like The Brave Little Toaster, it’s that they have emotions and are totally dedicated to their humans, and will do anything to reunite with them in case of separation. Which is probably why a beer truck ran over a man accused of stealing it in Georgia recently. 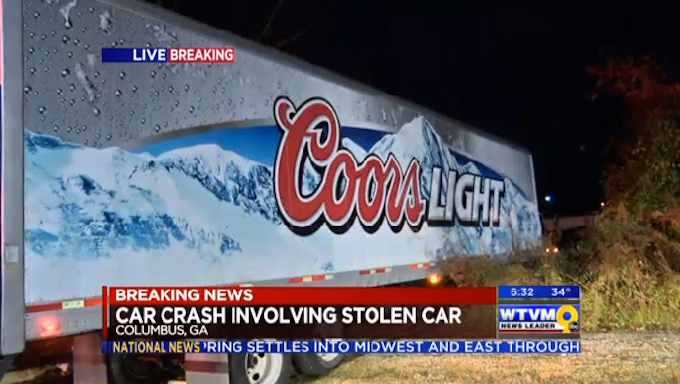 Police in Columbus, GA say the driver of a Coors Light beer truck left it parked and running while he went into a Circle K in the wee hours of Monday morning, reports WRBL.com. When he came back out, he realized his 18-wheeler had gone missing and called the police. Officers located the stolen semi-truck and caught up to the suspect driving it. The chase ended up near a Bojangles restaurant, where the man tried to get away and jumped out of the truck while it was still rolling, according to WTVM. The vehicle ran over his leg during the attempted escape, police said. Again, probably because the vehicle wanted to get back where it belonged, according to anthropomorphic cartoon canon. The 56-year-old suspect was arrested and is facing at least two charges connected to the incident. He was taken to the hospital before jail to treat a serious wound and a possibly broken leg.